I’m writing this from beautiful Atlanta, Georgia where I’m attending a leadership institute for those of us on teams that have received the Community Transformation Grant from the CDC (Center for Disease Control). I was going to tell you about what I’m learning in this post, but it got really long so I’ll save that for the next post. Today I want to share the most important step in planning for my trip. Eric and I always bring a picnic on the airplane with us. We usually have crackers or bread, a soft spreadable cheese like brie, a cured meat like sopressata, and some fruit like grapes or sliced apples. It’s better for us and more appetizing than what’s available on the airplane or in the airport. It’s also SO much cheaper. 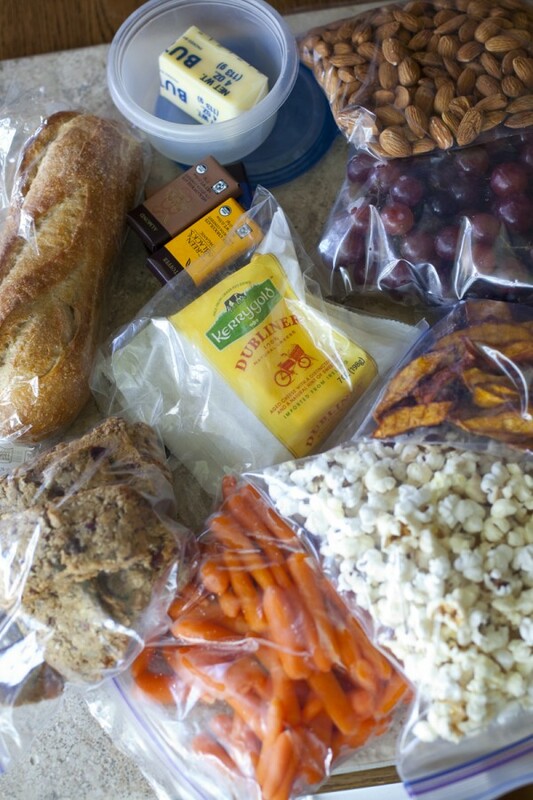 You can save anywhere from $20-50 if you bring your own food instead of buying it while you’re traveling. A fun thing about bringing such a great spread, is that it often impresses the flight crew. In fact, if the seat next to you is empty, you might have a flight attendant sit down and offer to trade you a couple mini bottles of wine for some of your food! As an expectant mother, having healthy food on my person while traveling is a must. First of all, if I let myself get too hungry, it’s pretty much the end of world. Typically, once I get hungry is when I get a craving and I suddenly feel so sick that I know only the one food I keep imagining will actually keep me from dying. 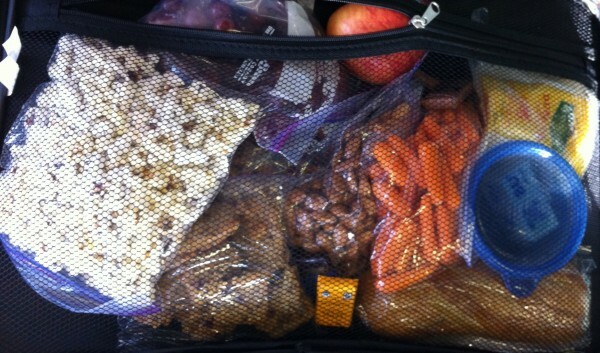 Trust me, it would be extremely embarrassing to have one of my hunger meltdowns on an airplane. I can imagine the headlines now, “Pregnant Woman Grounds Plane Demanding Thai Food”. In my first trimester, this urgent hunger led to me eating more junk food and fast food in three months than I have in the past five years. Fortunately, I soon learned that if I keep healthy snacks nearby, and don’t let myself get to the point of no return, I don’t get as many junk food cravings. This is not only better for me, but it’s especially better for my baby. At work I have a supply of yogurt, cheese, carrots and hummus, salad and milk. This has really helped me start eating healthy again and to stave off junk food cravings. But traveling has it’s own set of challenges. You can’t bring liquids or gels bigger than tiny little bottles in a ziploc bag, so that rules out juice or milk and things like yogurt, hummus and jam. Then you also have the food safety issue. You might have a fridge in your hotel room, but if you’re flying all day, your food will possibly be going through temperature changes and won’t be refrigerated. Now that I’m pregnant, I have to be even more careful about food safety, and can’t have the soft cheeses or cured meats that I normally love to travel with. I’m of course not going to let a few restrictions or limitations keep me from enjoying good affordable food, so here’s a list of snacks that I’ll pack a variety of in my rolling carry-on. Baby Carrots – These are an easy sturdy vegetable option that can go a few days without refrigeration. Apples – I can toss these in the bottom of my bag without worrying about crushing them, and they’re great when I need something sweet. Home Popped Popcorn – Popcorn counts as a whole grain! Don’t do the microwave version though, the chemicals are so bad for you. This is perfect when I’m craving something salty. I pop a batch on the stove, toss it with a little butter and salt, and separate it into a few plastic bags. Homemade Granola – I like to make my own so that I know exactly what’s in it, but you can also get this in bulk bins pretty cheaply. Hard Cheese – I’ll use a hard cheddar like Kerrygold Dubliner or something even harder like parmesan gruyere. The cheese won’t last my whole trip but is a great source of protein while I’m flying. Almonds – This protein source can safely last me the whole week. Just make sure, if you’re eating it them on the plane, to ask your seatmates if it’s okay for them to be around almonds. Some people have really severe nut allergies not limited to peanuts. Mini Baguette – Whole wheat is best but sometimes hard to find. Once you get through airport security, stop by Starbucks or one of the restaurants and ask for a plastic knife. Don’t try to bring on in your carry on! You could also do whole wheat crackers instead. Butter – I just cut three tablespoons off of a stick of butter and put it in a tiny food storage container with the wrapper still on. I keep it in the fridge until right before I head to the airport so that it’s completely solid when I go through security. Dried Fruit – I’ve been dehydrating my own plums and nectarines lately, which I love because I know that there’s no added sugar. But you can also get dried fruit cheaply in bulk bins. Granola Bars – These are great to be able to toss in your bag or shove in your pocket when you’re leaving your hotel for the day. Think about your dietary needs to decide what kind to get. Sometimes, if I don’t have any other protein snacks, I’ll get ones with extra protein. Other times I’ll look for bars with lots of fiber. Dark chocolate – Okay, I couldn’t limit the list to ten. Nummber 11 is a must for me! Dark chocolate is good for you, and a few squares can satisfy any sweet cravings. This list is far from complete, and not everything on it is possible for everyone. For instance, if you’re in a really hot area, maybe chocolate isn’t a good option for you. Or if you’re flying into or out of Hawaii or another country, produce may not be allowed. I’d love to add to my list so please let me know about your favorite travel snacks in the comments. Great suggestions! The other thing to keep in mind when selecting snacks is odor: what seems innocuous on the ground gets magnified exponentially in a crowded plane cabin. So true Kate! I’ve totally gotten sick from someone sitting by me eating corn nuts or flavored chips. This is great for us that are diabetic, even if we aren’t pregnant! Oooh I hadn’t even thought of that Tonja. Probably helpful for people with food allergies as well! This has reminded me that I’m out of dried fruit, so thanks for that!